Trump said the U.S. will pledge $50 million to a new World Bank fund to help women entrepreneurs. 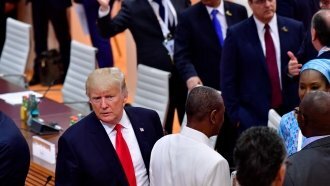 President Donald Trump stayed true to his “America First” policy at the G-20 summit, but there’s at least one thing he and many world leaders agree on. The U.S. will support the Women Entrepreneurs Finance Initiative, led by Trump's daughter Ivanka, with a $50 million pledge. The fund established by the World Bank hopes to raise about $1 billion to make it easier for women worldwide to establish and run businesses. But Trump hasn't built a great track record on women's issues. His administration is currently considering eliminating the White House Council on Women and Girls. The office was created by former President Barack Obama to examine how government policies affect women. And he's been criticized for some of his sexist comments about women. Most recently he came under fire for mocking MSNBC anchor Mika Brezenski, saying she looked like she was "bleeding badly from a facelift." Still, Trumps joins several countries in his support of the finance initiative, including Germany, Saudi Arabia and China.